We’ll fast-forward to the end. This is how Jenny is resting this evening. Extended Stay America is more comfortable than a hospital room. Jenny began the day with a headache. It was Day 3 after her surgery, and the last time she reached Day 3 of recovery after a mastectomy was one of the worst days in Jenny’s entire cancer journey. On that day in 2012, we made a trip to the Emergency Center after Jenny suffered a terrible headache. She’s had that headache three times in the past couple of years. 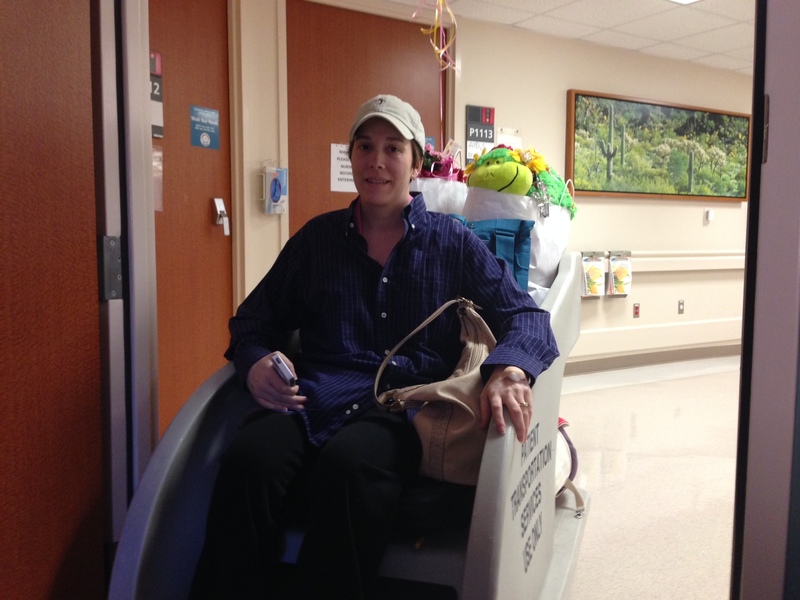 Sept. 18, 2012: The day she was diagnosed. 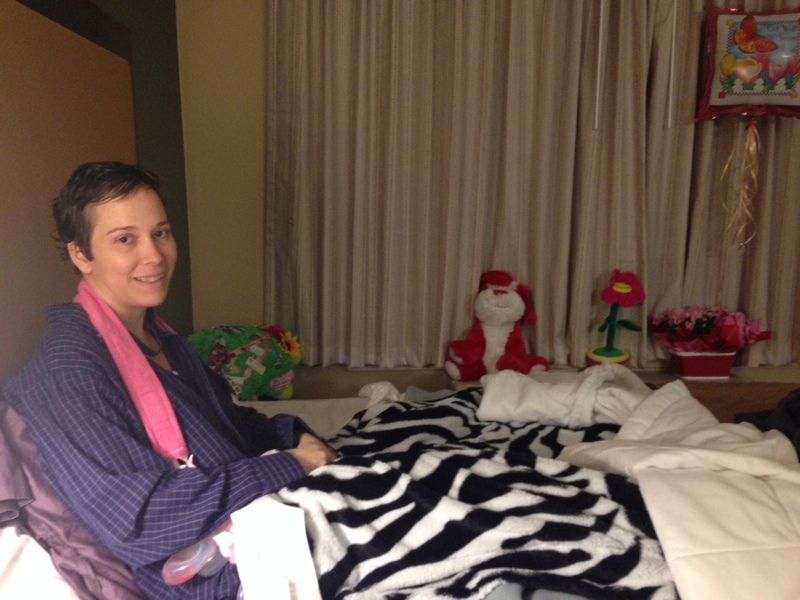 Nov. 8, 2012: Day 3 of recovery after Surgery No. 1. Nov. 26, 2012: The day the first infection postponed Surgery No. 2. Anyway, that headache is the only pain that rivals the first four rounds of chemotherapy in this journey. She doesn’t want the headache again. So when she woke up with a small headache this morning, she was worried. She’s already on hydrocodone, so she shouldn’t have a headache, right? Then she was nauseous. They gave her even more Tylenol and some nausea meds. That helped. Jenny was due to leave the hospital today, but the headache and nausea had her thinking otherwise. We stayed for awhile. In the afternoon, she felt a little better. So we packed up. But then the headache returned. They gave her another dose of hydrocodone and nausea meds. We stayed for awhile longer. The pain dulled. Other than the recurring headache, her other pain felt considerably better today. So we went back and forth on what was better — stay at the hospital another night or go to the hotel? In the end, there wasn’t a big difference. We had all the medication they would give her in the hospital room (after we asked for a prescription of nausea meds), so we determined that it was better to change scenery and have a real bed. Plus, those meds they gave her did help today. The headache never really became as debilitating as it did in those past episodes. So at about 5 p.m., Jenny went to the hotel. The traditional picture for leaving the hospital. I think we made the right call. Jenny took a shower and is sleeping. She reported no evidence of the headache at 7 p.m. tonight before falling asleep. We’re hoping it was just a weaker version of the complications with anesthesia that she felt with Surgery No. 1. P.S. It’s been six full days now since we left the house. We miss those kids of ours. It’s going to be a long wait till Tuesday, when we have follow-up appointments and drive home. So glad that headache never really developed and that you’re out of the hospital. Being able to set your own sleep/wake schedule should help a lot. Something else that couldn’t hurt is bringing one or two of those beloved peanut butter stacks over to the hotel for you two to enjoy. Wish we were there. We’d go get them for you. Alan, thanks for taking such good care of our girl. Funny you mention the Peanut Butter Stack, Linda. I actually made two trips for coffee today, buying a stack each time. We’re set. So glad she has you there taking such good care of her. And soooo glad that headache eased up. I hope she sleeps like a baby tonight. Much love to both of you! Can’t wait until you guys can come home!! Yes Alan, thanks for taking such good care of her. And thanks for keeping us updated with details through this blog.